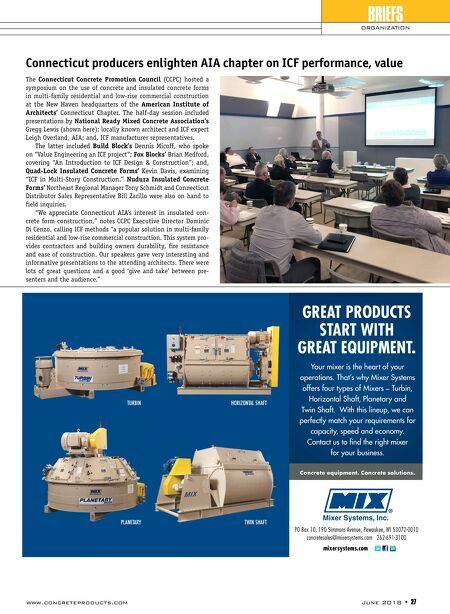 26 • June 2018 www.concreteproducts.com BRIEFS ACTIVITIES & APPOINTMENTS PRODUCERS Denver-based Summit Materials recently closed bolt-on transactions for Day Concrete of Ardmore, Okla., and Superior Ready-Mix of Somerset, Ky. The producers are strategic to platform businesses, RK Hall Construction and Hinkle Contracting, serving the respective market areas of north Texas, Oklahoma and Arkansas, plus Kentucky. The deals were noted in a quarterly review, where Summit CEO Tom Hill assessed encouraging metrics for the remainder of the year, especially regarding Texas and Utah materials operations and the Continental Cement business. "Heavy materials selling prices are trending higher in our core regional markets. Organic average sell- ing prices on aggregates increased on a reported and mix-adjusted basis in the first quarter 2018, with both Houston and Salt Lake City achieving high-single digit organic growth in aggregates selling prices, when compared to the prior-year period," he says. "Cement prices have now risen for six consecutive years in the United States, with no indications of abating. We anticipate our average realized selling price on cement sold in the Mississippi River corridor will grow in the low to mid single-digit percent range in 2018. As supplies of domestically produced cement continue to tighten, we anticipate price growth could escalate above current levels in 2019." "In Houston, our single largest ready-mix concrete market by volume, cement prices have increased by $6 per ton on a year-over- year basis," he added. "As a buyer of third-party cement in Houston for our ready-mix concrete operations, we believe higher cement prices will translate into higher ready-mix concrete prices in that market this year, given strong underlying demand in the region." Texas-based U.S. Concrete Inc. appointed William Sandbrook as chairman of the board at the close of the 2018 annual sharehold- ers meeting, held last month. Currently serving as president and chief executive officer, he succeeds Eugene Davis, who previously announced he would not seek reelection. "Bill's strategic vision has resulted in the company establishing leading positions in some of the most active construction markets in the country and continuous year-over-year increases in revenue and pricing growth," says U.S. Concrete Lead Independent Director Michael Lundin. "Throughout his tenure as president and CEO, he has proven adept at driving returns for our stockholders and managing risk accordingly." Sandbrook has led U.S. Concrete since 2011, during which time he has solidified the balance sheet and significantly expanded its ready-mixed concrete and aggregates capacity, especially in New York, Texas and northern California markets. Over the course of his tenure, U.S. Concrete has made a series of strategic acquisitions, positioning the company as the supplier of choice in non-commoditized concrete offerings for highly specialized projects across all construction verti- cals in those markets, plus Washington, D.C. and northern Virginia. Through its Eastern Missouri Concrete affiliate, St. Louis-based BMC Enterprises Inc. has acquired Hannibal, Mo.-based Mark Twain Redi Mix, whose assets include four plants, 50 mixer trucks, and a bulk hauling division. "This acquisition is exciting for us as we simul- taneously consolidate parts of our market, add to our geographic footprint, and create an immediate upstream synergy for our aggre- gate holdings," says BMC CEO Nathan McKean. "We are delighted to welcome the employees of Mark Twain Redi Mix into the family, and look forward to serving a new customer base in northeast Missouri." The transaction is consistent with a long-term, sustainable growth strategy in construction materials production, he adds. Mark Twain RM follows a handful of post-recession deals positioning BMC Enterprises—parent of the flagship Breckenridge Material Co. busi- ness—as the St. Louis region's largest ready mixed and aggregates producer, with 40-plus Missouri and Illinois locations. Smith-Midland Corp. will invest more than $3 million in an expan- sion of its Smith-Carolina operation, siting a new 15,000-sq.-ft. precast production plant on a 46-acre site in Reidsville, N.C. Estab- lished in 1979, the operation produces J-J Hooks highway safety barrier, highway sound wall, Easi-Set precast concrete buildings, and many other custom precast products. Current payroll is 25. "Smith-Carolina has been a good corporate citizen for almost 40 years in Rockingham County. We look forward to their expansion and the economic benefits it will bring in the future," says Rockingham County Board of Commissioners Chairman Mark Richardson. "There have been increasing demands from our customers. Our current facility is literately busting at the seams," adds Smith-Car- olina General Manager Rod Smith. 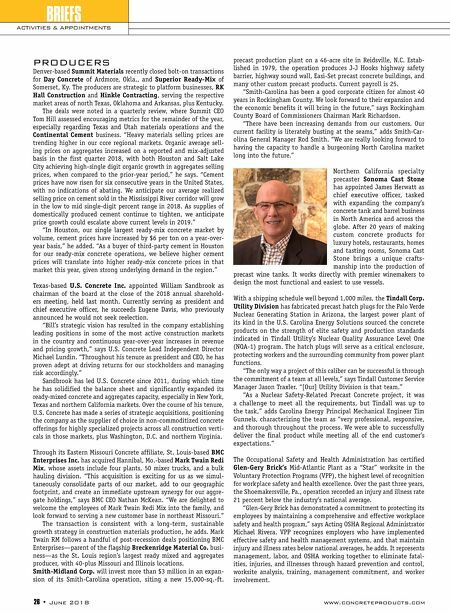 "We are really looking forward to having the capacity to handle a burgeoning North Carolina market long into the future." Northern California specialty precaster Sonoma Cast Stone has appointed James Herwatt as chief executive officer, tasked with expanding the company's concrete tank and barrel business in North America and across the globe. After 20 years of making custom concrete products for luxury hotels, restaurants, homes and tasting rooms, Sonoma Cast Stone brings a unique crafts- manship into the production of precast wine tanks. It works directly with premier winemakers to design the most functional and easiest to use vessels. With a shipping schedule well beyond 1,000 miles, the Tindall Corp. Utility Division has fabricated precast hatch plugs for the Palo Verde Nuclear Generating Station in Arizona, the largest power plant of its kind in the U.S. Carolina Energy Solutions sourced the concrete products on the strength of elite safety and production standards indicated in Tindall Utility's Nuclear Quality Assurance Level One (NQA-1) program. The hatch plugs will serve as a critical enclosure, protecting workers and the surrounding community from power plant functions. "The only way a project of this caliber can be successful is through the commitment of a team at all levels," says Tindall Customer Service Manager Jason Traxler. "[Our] Utility Division is that team." "As a Nuclear Safety-Related Precast Concrete project, it was a challenge to meet all the requirements, but Tindall was up to the task," adds Carolina Energy Principal Mechanical Engineer Tim Gunnels, characterizing the team as "very professional, responsive, and thorough throughout the process. We were able to successfully deliver the final product while meeting all of the end customer's expectations." The Occupational Safety and Health Administration has certified Glen-Gery Brick's Mid-Atlantic Plant as a "Star" worksite in the Voluntary Protection Programs (VPP), the highest level of recognition for workplace safety and health excellence. Over the past three years, the Shoemakersville, Pa., operation recorded an injury and illness rate 21 percent below the industry's national average. "Glen-Gery Brick has demonstrated a commitment to protecting its employees by maintaining a comprehensive and effective workplace safety and health program," says Acting OSHA Regional Administrator Michael Rivera. VPP recognizes employers who have implemented effective safety and health management systems, and that maintain injury and illness rates below national averages, he adds. It represents management, labor, and OSHA working together to eliminate fatal- ities, injuries, and illnesses through hazard prevention and control, worksite analysis, training, management commitment, and worker involvement.